Having already looked at Notre Dame’s statistical efficiency and where they rank among college football’s elite, it is no longer a silly proposition to include the Irish in the conversation for a spot in the college football playoff. Being among one of three teams with offensive and defensive efficiency in the top 10 (the other two being Alabama and Ohio State), the Irish are among the handful of elite teams at the moment that could compete with any in the country. With one of the strongest schedules left in the country, if Notre Dame wins out, they will likely reserve a spot in the college football playoff. If you asked me last week what Notre Dame’s chances were to run the table, I would have told you roughly 10% with a highly ranked and talented USC team on the horizon. Now, I would probably put it well over 20%. Surprisingly, ESPN’s Football Power Index would largely agree. Last week, the Irish had an 8.6% chance to run the table. After a statement win against USC, it is up to 19.5%. That is a huge departure from the 0.3% probability that it had in the preseason. NC State is having a breakthrough year under 5th-year coach Dave Doeren. The Wolfpack is currently ranked 14th in the polls, and if it weren’t for a one-touchdown loss to South Carolina, they would be undefeated. NC State is ranked slightly higher in the polls than the computer rankings as Jeff Sagarin has them as the 19th best team and ESPN’s FPI has them at 17. This is all against what is regarded by Sagarin as the 32nd toughest schedule. While NC State’s defensive line gets a lot of recognition and praise for their highly-rated NFL prospects, it has been the offense that has been carrying the team in efficiency with a quarterback who hasn’t thrown an interception all year. The FPI gives the offense an 82.6 rating, good for 10th in the country, while the defense is a little further behind at 62.7, ranking them at 46th. The special teams is a lowly 38.3 (114th) which gives them an overall efficiency of 76.9, good for the 19th most efficient team in the country. With the Irish at home in this game, the FPI give them a 76.9% chance to beat the visitors and avenging their close loss in a hurricane from a year ago. The rebuilding job that Dave Clawson has done at Wake Forest has been nothing short of stellar. Clawson has built the program back up the old-fashioned way with solid recruiting and stressing fundamentals. In their continuous and gradual climb, the Demon Deacons football team is ranked 30th in the Sagarin rankings and 37th in the FPI. If people are doubting the quality of Wake Forest and their 4-3 record, this has been done against the 26th toughest schedule according to Sagarin. No surprise, Wake Forest is considered to be significantly more efficient than their rankings would suggest. This has been led by the defense that current Notre Dame defensive coordinator Mike Elko set the foundation for and that Jay Sawvel has furthered. The defense’s efficiency rating is 74.9 (20th) while the offense is 62.3 (39th) and the special teams is 51.1 (61st) for an overall rating of 73.1, good for 21st overall in the nation. This level of efficiency makes Wake Forest a sneaky good opponent, but the FPI still gives the Irish a 90.3% chance to win. Mark Richt looks to have his alma mater ahead of schedule with his team currently 6-0 and #8 in the country. Despite the lofty ranking in the polls, there are many who believe that this Miami team may be vastly overrated. Sagarin has Miami ranked as his 16th best team while the FPI has them at 14. This despite having played what is regarded as the 29th toughest schedule by Sagarin. Much of the reason why Miami is as highly respected is because of their good, but not great efficiency numbers. Miami is the 16th in overall efficiency (closer to where they stand in the computer rankings) with a 78.5 rating, with the 14th most efficient offense (78.7), the 24th defense (74.1), and the abysmally low 122nd rated special teams (34.1). Notre Dame outclasses Miami in each department and will need every bit of it to get the win on the road. Last week Miami was favored to win, but this week the FPI favors the Irish by giving them a 58.6% chance of success. Navy is always a tough team under Ken Nuimatalolo and it doesn’t seem to matter when players graduate, they are truly a system team and can plug and play the next guy available. Navy has taken a step back this year, currently unranked in the polls, but Sagarin has them as the 55th team in the country (behind a pair of FCS teams in North Dakota State and James Madison) while the FPI has them at 62nd. Navy has played the 67th toughest schedule to date. As can be expected, the Navy offense is their most efficient unit ranking it 37th in the nation with a 62.8 rating. Their defense is 63rd with a 50.8 rating while their special teams is 72nd with 47.3 rating. All together, Navy is the 50th most efficient team in the nation at 58.4. The FPI gives Notre Dame a 95.5% and would require a major lapse in concentration for the Midshipmen to pull the upset. 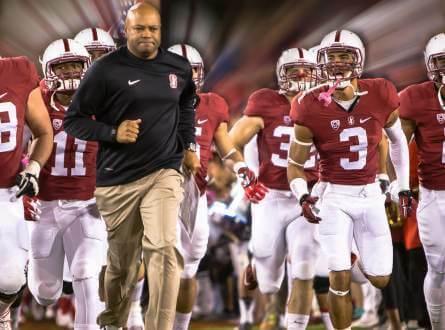 Jim Harbaugh built this Stanford program and David Shaw has done a great job maintaining a high standard as they have won PAC 12 titles and a pair of Rose Bowls under his tenure. This year, they faced adversity early in the season with a pair of losses against a then top-5 USC team and a shocker to San Diego State. This has seen the Cardinal battle back up the polls where they are currently 20th in the nation with a Sagarin ranking of 14 and an FPI ranking of 13. This is against the 23rd toughest schedule in the country. Stanford is the 15th most efficient team in the country with a rating of 88.2. This is obviously led by the offense which is riding Heisman frontrunner Bryce Love for the 4th most efficient offense in the country with an 88.2 rating. The defense which has traditionally been a strength of Stanford has instead held them back, currently ranked 60th with a 52.8 rating. The special teams is at a stellar 11th with a 68.4 rating and could very well be a difference maker in the matchup. This is the lone game where ESPN’s FPI has Notre Dame’s opponent as the favorite, but with a 49.7% chance to win, this is more of a toss-up for a team that could very well be knocking on the door of their first playoff appearance.